Rev. Terry Highland conducted his final service as interim rector of St. Peter’s Episcopal Church in Delaware on Sunday, Sept. 30. A potluck luncheon was held following the service in appreciation and celebration of his more than three years of spirited guidance. The new, permanent rector, Rev. David Kendall-Sperry, will publicly assume leadership on Sunday, Nov. 4. All those in the parish are invited to join in welcoming him to the community. Highland has been a familiar figure at Grady Memorial Hospital in Delaware and other facilities in central Ohio, where he visited and counseled those in need. He plans to continue this role as a hospital chaplain in his home city of Melbourne, Florida. Highland was a strong presence at St. Peter’s through a pivotal time in its growth. 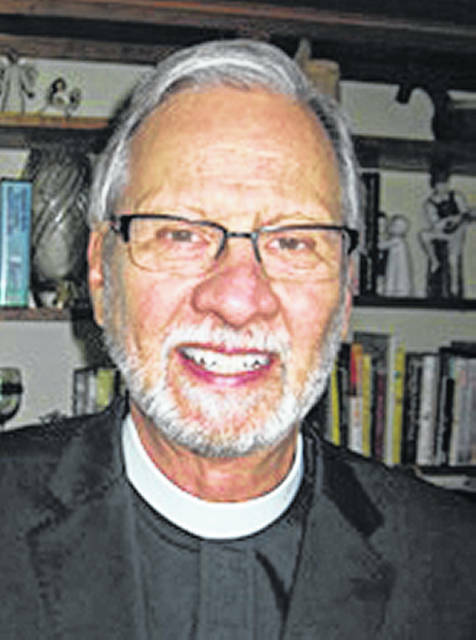 He presided over the church’s bicentennial celebration in 2017, a highlight of which was the unveiling of a National Registry of Historic Places marker by both the oldest and youngest of the 150-member congregation. He also led the church through a long, detailed process of “recasting” St. Peter’s purpose and objectives for the coming decades of this new century. Highland initiated the children’s sermon, one of the most popular and enjoyable segments of the weekly service. St. Peter’s emphasis on youth leadership will continue to be a priority for the incoming permanent rector as well. Highland and his wife will return to their home in Florida with many new friends and many good memories. “If I could write a letter just filled with the words ‘thank you’ over and over, I would never be able to write enough of them to truly express how I feel about the time I spent here,” Highland said. St. Peter’s Episcopal Church is located at 45 W. Winter St. in Delaware. All are encouraged to stop by for a visit. Submitted by St. Peter’s Episcopal Church, Delaware.